More than 100 million Americans with inadequate or no medical coverage . . . Dirty examination and operating rooms in doctor's offices and hospitals . . . Health care executives pulling in millions in bonuses for denying treatment to the sick . . . This may sound like the predicament of a third-world nation, but this is America's health care reality today. The U.S. spends more on health care than any other nation, yet our benefits are shrinking and life expectancy is shorter here than in countries that spend significantly less per capita. Meanwhile, HMOs, pharmaceutical companies, and hospital chains reap tremendous profits, while politicians — beholden to insurers and drug companies — enact legislation for the benefit of the few rather than the many, as the entire system verges on collapse. Critical Condition exposes the horror of what health care in America has become. 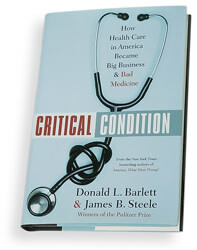 Barlett and Steele profile patients and doctors trapped by the system and offer startling personal stories that illuminate what's gone wrong. Doctors tell of being second-guessed and undermined by health care insurers; nurses recount chilling tales of hospital meltdowns; patients explain how they've been victimized by a system that is meant to care for them. Drug companies profit by selling pills in the same manner that Madison Avenue sells soap, while Wall Street rakes in billions by building up and then tearing down health care businesses. And politicians pass legislation perpetuating the injustices and outright fraud the system encourages. By analyzing the industry and offering an insightful prescription for getting it back on the right track, Critical Condition is a compelling investigative work that addresses the concerns of every American.